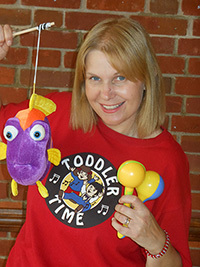 Toddler Time is well known and well loved as one of the liveliest, most interactive music group for babies, toddlers and pre-schoolers. Over the years thousands of babies and toddlers have had loads of fun bopping along to my unique mix of songs, games and props. I love to watch the children wiggle and giggle they don’t realise just how much they are learning as they play. Why not come and have some fun with your little one, pop along and join us at a session new faces are always welcome. Please keep reading for more information about my sessions. You can of course also give me a ring 01908 647405 or email annettecowell@aol.com and I will answer any questions you may have. What happens at a Toddler Time session? You can expect music, dancing, fun and games and a live vocal to guide your children through all the activities . We love to sing, clap, jump and wiggle to a variety of songs, old and new. The children are given the opportunity to experiment and play with different musical instruments and colourful props such as dancing ribbons, beanbags and balls. During quieter moments the children love to guess what’s hiding in the nursery rhyme bag. How is Toddler Time different? How can coming to Toddler Time help your child? By listening to the music and joining in with the activities children develop their physical abilities, rhythmic awareness and co-ordination. Singing the songs will aid speech, and copying actions will help concentration and motor skills. Singing and dancing with other children provides a great opportunity to improve social skills and confidence, it’s all there in a Toddler Time session. It is never too young to introduce your child to music and they will enjoy the company of others while listening, watching and being bounced on your knee. No. Admission is just £4 per family (up to 3 children) additional children 50 p each, on a pay as you come basis, all refreshments are included. Do Toddler Time provide party entertainment? Yes for children aged between 2 and 8 years. 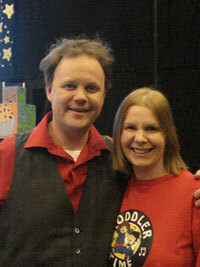 Please click on the our parties button at the side of the page for more information.